While Friday the 13th may be bad luck for some, such was not the case for the U.S. stem cell industry. 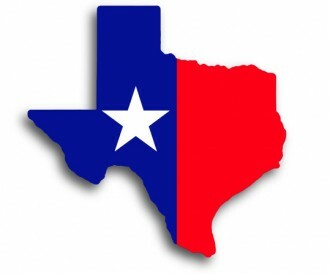 On Friday, April 13, the Texas Medical Board (TMB) approved the first set of regulations which will allow physicians to offer autologous adult stem cell therapies. These are stem cells from your own body for your own usage. The Texas bill was drafted over the past year and the final version was released for public comment in March. After the 30 day public comment period, the bill went for final vote on April 13. The TMB passed the new regulation by a vote of 10 to 4. Although the FDA has published regulations for embryonic stem cells and allogeneic stem cell therapies, there has not been a clear cut FDA pathway for autologous adult stem cell therapies. After years of waiting, some physician practices (ours included) recently received FDA guidance on adipose stem cells, but the rules are not written in stone. Regulations are not official until they become part of the Federal Register. The resulting ‘time out’ and lack of guidance by the FDA created uncertainty among doctors and forced many patients to seek autologous stem cell therapy abroad. To help bridge the gap, the Texas Medical Board created regulations for autologous adult stem cell therapies, the area not yet formalized by the FDA. Unlike embryonic stem cells, adult stem cell therapies have no ethical issues. Adult stem cells can be extracted from bone marrow, adipose fat, umbilical cord blood, dental pulp and other adult tissues. These stem cells have been used to treat a wide range of diseases and injuries. Over 3000 clinical trials using adult stem cells have taken place over the past few decades. The regulation applies only to stem cell therapies that are not currently regulated by the FDA. Thus, this regulation applies to certain types of autologous adult stem cell therapies. Allogeneic therapies (donor cells) and embryonic stem cell treatments are not applicable as they are already delineated as HCT/P 351 drugs by the FDA. Texas physicians must file an IRB which is affiliated with a hospital or academic institution. Texas physicians are NOT required to file an IND (Investigational New Drug Application) with the FDA. Informed Consents must be IRB approved and state to the patient that the stem cell therapy is experimental. Patient results and follow up care must be reported to the IRB, and doctors must be able to respond to information requests by the Texas Medical Board within 14 days of inquiry. A physician can charge a fee for the therapy as long as there are no placebos in the therapy. While some members of the stem cell research community are unhappy over the Texas Medical Board’s decision, many practicing physicians view the new regulations as a positive step in innovation and patient treatment. The difference of opinion between researchers and doctors has to do with each side’s tolerance for risks and benefits. Many scientists assess risks and benefits primarily via prospective ‘randomized clinical trials’ (RCT), a process which is common place for the testing of drugs that will be manufactured and distributed to thousands of people. Scientists do not interact with the patient and therefore must control as many variables as possible (randomized clinical trials) in order to be assured of the highest possible evidence of safety and efficacy. But practicing physicians communicate with their patients on a one-to-one basis and are comfortable assessing levels of risk/benefits during their patient’s therapy. They do not need every external parameter to be controlled in order to see meaningful levels of safety and efficacy with a therapy. Therefore, throughout history much medical innovation has come outside of prospective randomized clinical trials. Physicians validate findings of safety and efficacy via case reports, non-randomized clinical trials, and a peer review mechanism well established by the medical community. Non randomized clinical trials performed outside of the FDA purview can show safety, proof of concept, and enough information about risks and benefits to allow for patients to make informed choices. Traditionally, the FDA’s purview has been the safety of “one-to-many” manufactured products. These are drugs, devices, and donor/allogeneic tissues which are dispensed to many people. On the other hand, autologous stem cell therapy is a ‘one-to-one relationship’. This is because the cell or product is only distributed to one person, the patient himself. The risks and benefits of “one-to-one therapy” have traditionally fallen under the purview of ‘Practice of Medicine’. Following such precedents, the risks and benefits for autologous therapy should be an issue of consent between you (the patient) and your doctor. And therein lies another reason why the Texas Medical Board has exercised it’s authority over autologous stem cell therapy. The Practice of Medicine is primarily regulated by each state’s Medical Board , but doctors are accountable on many levels to many organizations. In addition to the State Medical Board, there are layers of peer review organizations that include professional societies, peer review journals, malpractice insurance carriers, hospital boards, licensing and accreditation agencies, the community, and ultimately a courtroom with a jury. Equally as important is the fact that the patient interacts with their doctor face to face, and doctors get informed consent from every patient before every procedure. Whether it is a traditional procedure or an experimental procedure, the informed consent is part of the process. During the informed consent process doctors give you an idea about the safety and efficacy of the procedure. If your treatment is experimental, the informed consent outlines that fact. But last week there was even more good news for the stem cell sector! 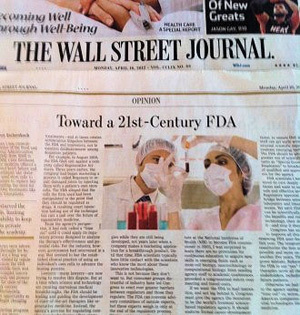 A few days after the Texas announcement the Wall Street Journal posted an Op Ed piece written by the former FDA commissioner in support of stem cell therapy. In the Op Ed piece the former commissioner, Dr. Andrew von Eschenbach, called for a move toward a 21st-Century FDA. He noted the need to overhaul the current FDA regulations and process for evaluating new technologies such as Regenerative Medicine. Furthermore he called attention to the lawsuit of the FDA against a Colorado physician’s right to perform autologous stem cell therapy. In a hat tip to the seriousness of Dr. Centeno’s case, the former FDA commissioner pointed out how ‘lawyers–many lawyers are trying to resolve the dispute’. We have previously written about the issues surrounding U.S. vs. Regenerative Sciences here on this blog. The outcome of this case will no doubt be a landmark decision for the stem cell industry. When I was commissioner of the FDA from 2005 to 2009, I saw firsthand how regenerative medicine offered a cure for kidney and heart failure and other chronic conditions like diabetes. Researchers used stem cells to grow cells and tissues to replace failing organs, eliminating the need for expensive supportive treatments like dialysis and organ transplants. But the beneficiaries were laboratory animals…..the FDA doesn’t have the scientific tools and resources to review complex innovations more expeditiously and pioneer regulatory pathways for state of the art therapies that defy current agency conventions. In conclusion, this is a tipping point for stem cell therapy. We salute the Texas Medical Board and all the hard work it took to get to this point! It’s your own cells and you deserve the right to use them. In Texas, patients now have a choice. You don’t have to risk being a placebo in a randomized clinical trial, you can have the therapy, as long as you understand the risks. We would love to hear your thoughts and comments on the topic. nice article! this is certainly good news for regenerative med docs and patients. florida, not to be outdone, is entertaining a similar bill in their legislature. hopefully, maryland, virginia, west virginia, and pennsylvania will follow suit. Thank you for the exciting news! I’m sanguine that this is a sign of anew beginnings. Pardon my facetiousness, but am I being too demanding to appeal for an option other than Texas.